Not only will you learn more about the profession, but you will learn from other students on how they plan their strategies for a successful admissions outcome. It’s a way to stay on track and gauge your progress from others in the same boat. It’s a way to stay encouraged as you face the individual hurdles like taking the OAT and writing your personal essays. 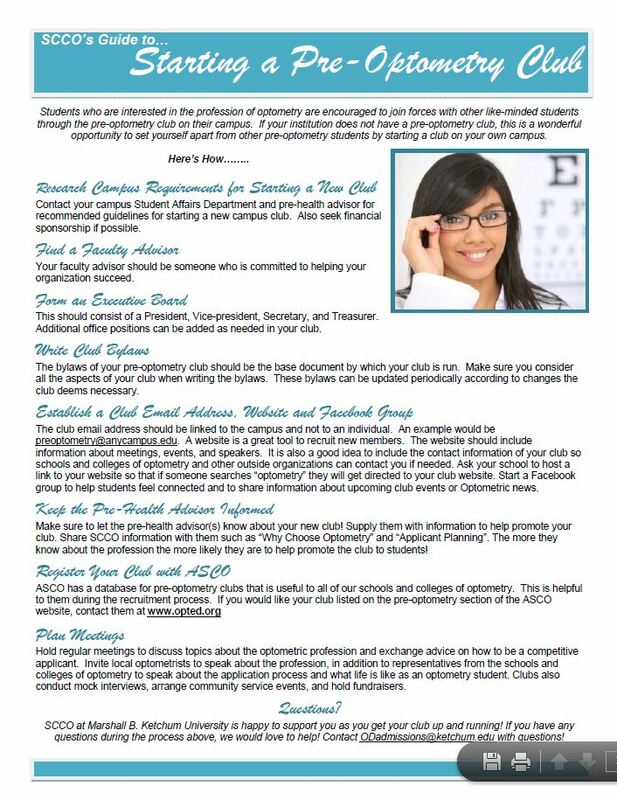 If you don’t have a pre-optometry club on your campus, you have a GOLDEN OPPORTUNITY to start one! These clubs not only serve pre-optometry students, but they also serve the profession by creating interest on behalf of optometry to other pre-health students who are undecided, who have yet to choose how they want to serve in healthcare. It’s easy to start a club and run the meetings. Go on Facebook and join the many clubs hosting pages to get advice from well-established clubs for meeting agendas and speakers. Once you establish the club, you elect officers. When a senior officer graduates, the club’s leadership transfers to the president elect and the new officers; thus the club grows with each successive season and from contributions from each year’s membership. Best of all, YOU are the founding president–now that’s something to talk about when you interview! Don’t be that embarrassed applicant in an interview, who after just stating why they love the optometry so much, when asked if they are a member of their club’s pre-optometry club, they have to admit that they are not. It’s a must! My college just recently started one and I love it. anyone still on the fence, definitely do it!